Michael McFadyen's Scuba Diving - Shark Point This is another one of those magical dive sites that are so prevalent in Sydney. 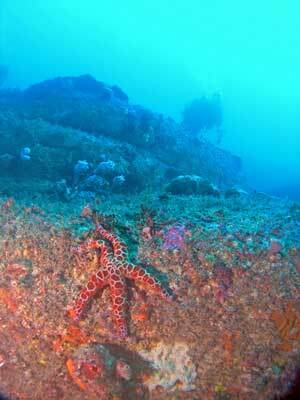 However, most persons who dive this spot only see the tip of its potential as they do not dive the best areas. 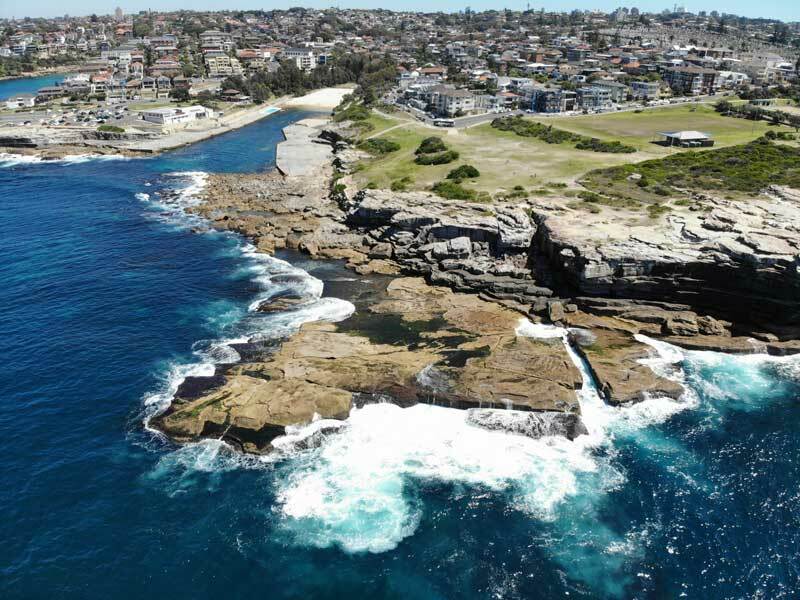 Shark Point is located on the north side of Clovelly Bay in Sydney's Eastern Suburbs. Only eight kilometres from the city, Clovelly is home to three very well known dive locations, Gordons Bay (better known as Thompsons Bay), Clovelly Pool and Shark Point. By far the best of these sites is Shark Point, although the dive location is such that it should never be dived by inexperienced divers without an experienced person accompanying them. This is real, believe me!! Many divers have had to be rescued by helicopter or lifesavers after getting into trouble here. Shark Point from my drone - the entry point is the bottom left point, although some use the crack at right. It is also an excellent night dive, but again, do not even think of diving here without some very experienced divers and without having done numerous dives here to get a better understanding of the site. The actual Shark Point dive site is accessible from either side of Clovelly Bay, although the best entry point for the most enjoyable dive is from the northern side. Park your vehicle at the bottom end of Ocean Street or at the start of Eastbourne Avenue, Clovelly, near the bus terminus and turning point. Before gearing up, walk to the rough pathway that leads down to the rock platform. Look out towards the point itself and ascertain if the seas are suitable. This is the normal entry and exit point. There is another entry point and this is even better. From where you have parked your car, walk across the grass to the east. Here you will find a fissure that runs from the top right down into the water. The entry point is on the south side of the fissure. To enter and exit from the first spot at the point, relatively calm seas are required. The entry point is from a few metres inside the point or right on the point itself. You will need to determine this when you get there, contingent on seas and tides. The fissure entry requires even calmer seas. The exit is to the immediate west of the point. 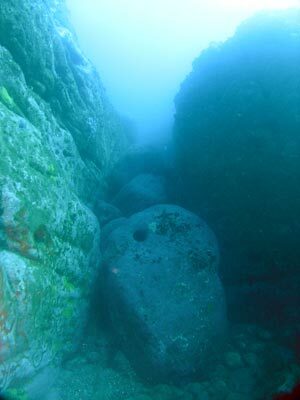 There are two spots, both are flat, slightly sloping rocks about 10 metres wide and 12 metres long. One is more suitable for lower tides (the western one) and the other is better for higher tides. Although the exit spots can look difficult in even calm seas, the bottom is well cushioned by cunjovoi and the waves disperse very quickly so that there is usually no problem to swim onto the rock platform using the wave action to assist you. In bigger seas you can enter the water through Clovelly Pool itself, but the local council has prohibited scuba diving in Clovelly Bay as follows. 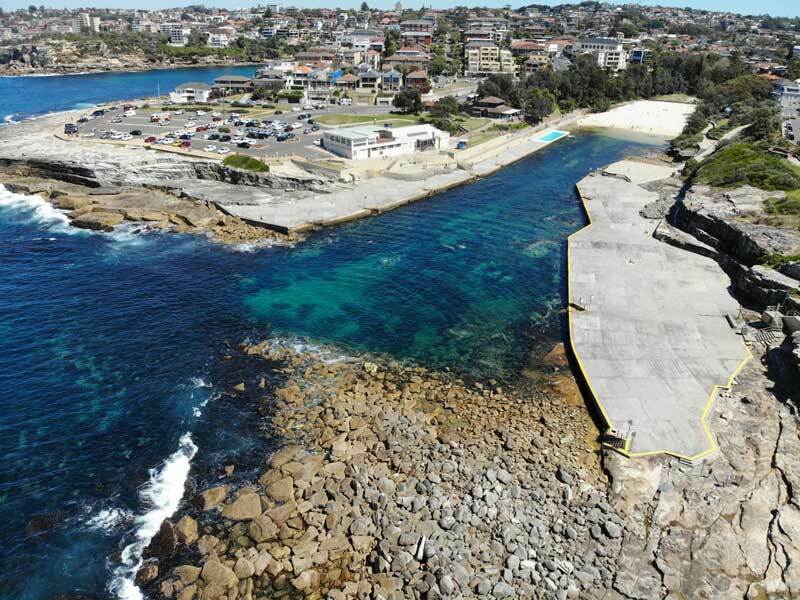 From 1 October till 30 April (used to be the October Long Weekend till Anzac Day), scuba divers can only enter the water of Clovelly Pool before 8 am (used to be 10 am) and after 6 pm (used to be 4 pm). between the hours of 10 am and 4 pm during the official swimming period which usually runs from the October long weekend till Anzac Day. This ban was found necessary because of the large number of schools using the area for instruction and so interfering with the general public's use of the area. Believe the signs, you will be prosecuted for ignoring them, even if you only swim on the surface out through the bay. If you do use the pool to start your dive, be aware that on ebb tides the flow of water out over the pool wall can make it extremely difficult to return back to the pool. Also, using the pool means that you will have to swim a lot further to reach Shark Point and will, in all likelihood, not see the best parts of the dive. This is also the emergency exit point (I have had to use it twice). After entering the water from the point, swim out about 15 metres before submerging. Here the water is about 8 metres deep. Start the dive by heading in a south-easterly direction. At first you will swim over a large kelp bed for a few minutes and then you will reach a small drop-off where the depth reaches 10 metres. Thirty metres further on in the same direction you will meet another drop-off where the water is 13 metres deep. The terrain past here is composed of huge rounded boulders that provide a lot of nooks and crannies where a large amount of fish live. There are also a number of swim-throughs between the boulders. Continue on to the south-east and you reach a sandy bottom and a depth of 20 metres. On the sand there are some small rocks which have prolific sponge and ascidians growing on them. When you meet the sand, turn to your left and follow the reef edge to the north until it turns to the east. 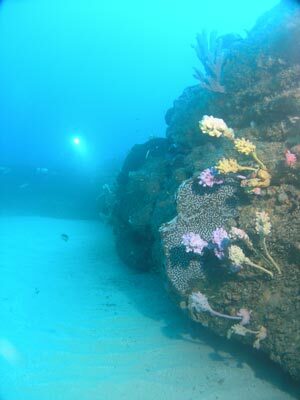 Soon you will see an overhang where a lot of wobbegongs and cuttlefish live, as well as bullseyes and roughies. Just past here the depth reaches 23 metres and the edge turns back to the north for a short distance before it again turns to the east. Here there are another series of overhangs (look under for blue devilfish) before the edge once again turns back to the north. More low rocks are located off the reef edge in this spot and the edge is now composed of large rocks. In this area you may be lucky to see a common sea dragon, look on the sand a few metres off the rock edge. In June 2008 we saw about five along this section, including a small 150 mm long one. 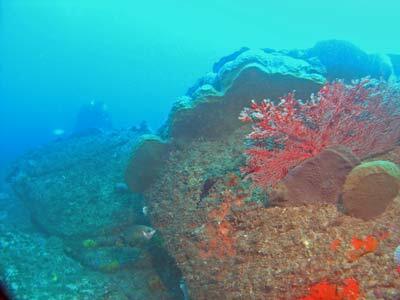 After a small indent in the reef, the depth reaches 26 metres. On the rocks in this area you can find pygmy pipehorses. In fact, the first ones ever seen (at least by someone who recognised that they were a new species) were found here. By now, if you have travelled at a fairly leisurely pace, you will have used about half of your air supply. You will also be starting to run low on available bottom time. Rather than returning back along the route you have followed, a better alternative is to go straight back to the exit point. Taking a bearing of due west, swim back over the jumble of rocks, ascending slowly. After about 60 metres you will reach the 19 metres level where there is a drop-off. A very large overhang is located under the wall and very close by on your left there should be a good swim-through. After a short time examining these interesting features, continue to the west over another steep wall (sand before is about 15 metres) until you reach a kelp bed. When the depth has come up to 8 metres you will be in the vicinity of the rock platform and will see the waves breaking on the shore above. You will first meet a low wall which you follow to your left and then a wall that stretches up to the surface. Follow it to the south. After a couple of dives here (when you have more understanding of the site), when you reach the wall at 19 metres, turn right and follow this north and then west when it turns. Soon you will come to a corner where the wall goes to the north again. Here you will see that ahead there is a largish crack. This runs west and ascends. Swim up the crack. There are some large boulders in the crack so you will at times need to swim around or over them. Eventually you will be in the 7 to 8 metre mark and ahead white water on the surface. Go to your left at 45°, over a small wall to about 4 metres and then drop back to 7 metres. You will then see the rock platform ahead. Turn left and follow. No matter which directions you have followed, you will now be near the entry/exit point and will see a corner and the wall turns to the west. Go around the corner for about 20 metres. Then, swim a little to the north before ascending to check on the condition of the exit. If everything looks okay, drop back under the surface, a bit deeper than the start of the exit ahead. Swim towards the exit and using the rocks and sea growth to help you along, swim north and up and over the small ledge onto the exit spot. Due to the waves breaking on the rocks, the visibility when exiting may be very poor, but continue on anyway. Crawl along the bottom until you reach the dry land. If there are a number of you, have the most experienced diver exit alone and remove all their equipment. Now all the other divers should come in one at a time. The first diver can help the others remove fins and steady them if larger waves come along. If you enter at the fissure, follow the crack underwater till you reach the sand at 25 metres or so (this is the reverse of the alternative route above). The crack is quite obvious, although a couple of times it is filled with large rocks. There are a couple of gullies on the left at 15 metres or so, these are worth exploring. It will have taken you about ten minutes to get here to the sand. Once at this depth, follow the sand edge to the north, winding in and out of the rocks and small walls. The sponge gardens and other fixed life is excellent in this area. After about 24 or 27 minutes, ascend up to the 20 metre level and head back to the south. The bottom here is mostly small boulders and flat rock, with an occasional small wall. Once you have done another 12 minutes or so (say 36 minutes), head due west rising up over the 15 and 10 metre dropoffs (these are quite large walls) and eventually you will be in 7 to 9 metres of water, right adjacent to the rock platform. Follow this to the south and once you find a sharp turn to the west, this is the point and the preferred exit point. See earlier description for how to exit. If you use the Clovelly Pool entry, swim out over the wall and snorkel another 30 metres before submerging and heading out to sea on a bearing of 120°. After a few minutes of a bottom composed of very large rocks, you will see a small wall where the depth is 8 metres and a sand patch. Past this there is a kelp bed and the depth comes back up to 6 metres. Here there is another more pronounced wall where the depth drops off to 10 metres. A number of overhangs are in the wall, with some very large wobbegongs and cuttlefish often seen in them. It would take at least five minutes of constant finning to reach this spot. After examining the area around this spot, follow the wall to the north-east for two or three minutes until the wall "disappears". Return to your original heading of 120° and, after going over a small patch of kelp, the depth again rises, this time to 8 metres before it drops away to a sea floor of large boulders. After four or five minutes of easy swimming you will be on the sand at a depth of about 20 metres. Follow the edge to the north-east for a while until you have used half your air. 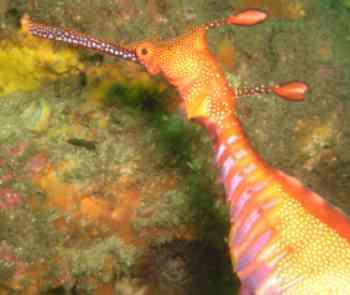 In this area you might also see common sea dragons. Follow the edge back to the south-west past the spot where you met the sand and around the next corner. Your heading will be approximately 300° and after 10 or 15 metres you will see a prominent crack which heads in the same direction. 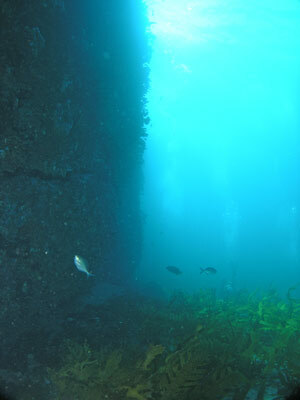 Keep following it as it rises to 8 metres and the crack narrows and the rock either side becomes covered with kelp. A three minute constant swim from the corner will bring you back to the same spot as you met the wall at the 10 metre level. Continue following the same heading back to the pool wall and when you get to a depth of 6 metres over a rocky bottom, surface and check that you are on target to return back to the pool. This version of the dive is suitable for a night dive, although care must be taken to ensure that you find the right route back over the pool wall. Go too far on the return trip and you will end up dashed on the rocks at the southern end of the Clovelly Pool promenade. The dive can also be done from Shark Point exiting back inside the pool. To do this, head east after entering the water. Once you hit the sand, follow the edge to the south (actually more to the south-west) until after 15 minutes or so in the water. Then start heading shallower, say west to north-west. You will come up over a couple of walls until you are in the seven metre range. If in doubt, head more to the north. Follow this depth contour until you come to a small boulder area. Surface and check you location and then go over the wall into Clovelly Pool. The easiest way by far to dive Shark Point is to do it by boat. However, it is a long way here from either Botany Bay or Sydney Harbour (it is about 46.5 kilometres return from the Cooks River boat ramp in Botany Bay) and I do not know of any dive charter boat offering dives here. I have found the best spot to anchor is just north of the fissure at GPS Mark 33° 54' 58"S 151° 16' 17"E (note AUS66 datum used for all GPS Marks - see my GPS page for details) and anchor in about 18 metres of water. From here you can do the deeper reef to the north before returning a bit shallower. There is a very large cave to the north of the anchor spot, in about 16 metres. Visibility is generally good, in the order of 10 to 15 metres. 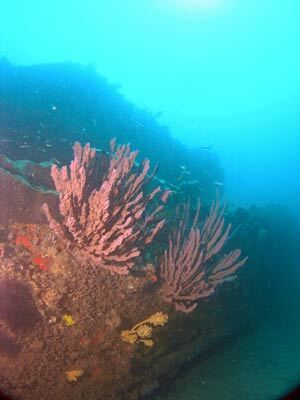 In May 1999 I had 20 metres visibility on two dives here and in mid-2009 we had 20 metres viz on two night dives. Apart from its effect on going over the pool wall, tides do not greatly affect your dive but the dive from the point is most often affected by a slight to strongish current from the north. Fish to be seen on this dive include blue groper, bream, snapper, kingfish, eastern blue devifish, giant cuttlefish and flathead as well as all the usual fish. On some dives here I have seen longfin bannerfish, angelsharks, firefish, giant boarfish, shovelnosed rays and many other rarer fish. Pygmy pipehorses have also been seen here by divers when I have been diving. My wife, Kelly, even saw a seal here in July 2005! A fantastic dive site, well worth doing time and time again.